On Thursday, with no public announcement or consultation, South Africa informed the United Nations (UN) that it was withdrawing from the International Criminal Court (ICC), becoming the second nation in just a matter of days to do so. Burundi was the first. But South Africa’s announcement was much more shocking. Whereas Burundi is currently experiencing violent political instability, and its leaders face immediate fears of being investigated and charged by the Court, South Africa is supposed to be a beacon of liberal democracy on the continent. According to its world-renowned constitution, and the human rights-based foreign policy espoused by the late Nelson Mandela, South Africa should be at the vanguard of efforts to deliver justice to victims of war crimes and genocide. Instead, South Africa now finds itself siding with wanted alleged war criminals, such as Sudan’s President Omar al-Bashir, who is accused by the ICC of committing genocide in Darfur. It is a remarkable fall from grace – although, if South Africans are honest with themselves, it was not entirely unexpected. South Africa’s ruling party, the African National Congress, has been making anti-ICC noises for some time, while South African diplomats have in recent years enthusiastically supported the continental backlash against the court. Legally, the decision will have little immediate impact. The Rome Statute, which constituted the ICC, only allows for a state to withdraw a full year after the (legal) notice of withdrawal is delivered to the UN Secretary-General. In other words, South Africa will remain a member of the ICC until 20 October 2017. And the withdrawal will obviously not apply retrospectively in relation to South Africa’s legal obligations. Moreover, it is still highly doubtful whether the presidency had the legal authority to deliver that notice without prior approval from the South African Parliament. Given that Parliament must ratify international treaties of this nature to make them legally binding, it follows that only Parliament can remove those legal obligations. This will be tested in court soon as a coalition of civil society organisations intends to lodge an urgent court application to have the decision to withdraw declared unlawful. This pressure has caused the South African government to backtrack somewhat, stating that it now expects Parliament to get involved. There are even unconfirmed rumours that the process has been halted in New York. Less clear are the political consequences. There is little doubt among independent journalists and civil society activists in South Africa that the motivation for the proposed withdrawal is political rather than legal, and that it is inextricably linked to the president’s own domestic issues. 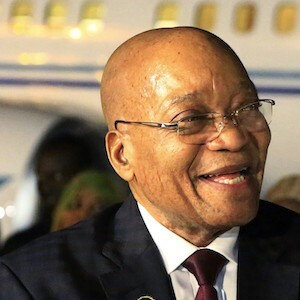 President Jacob Zuma is under extraordinary domestic pressure following multiple corruption scandals, widespread social unrest and a historically poor performance by the ruling party in the recent local elections. As the pressure on Zuma grows, so his actions become more desperate. Witness the recent, trumped-up fraud charge laid against Finance Minister Pravin Gordhan, who has refused to allow the presidency to dictate to the Treasury; and now this decision on the ICC. The intended political benefits are three-fold. First, Zuma hopes to undermine the anticipated Constitutional Court hearing on the government’s handling of the Bashir case. Two lower courts have already ruled that the South African government failed in its international obligations when it did not arrest al-Bashir when he visited the country for an African Union summit in June 2015. The Constitutional Court, South Africa’s highest legal authority, is widely expected to uphold these decisions. Although South Africa’s notice to withdraw will have no legal bearing on the case, it will allow the government to mitigate its guilt, at least in the public eye, by arguing that it is no longer part of the ICC statute. Second, Zuma wants to shift the national narrative away from his own controversies. These include (but are not limited to) the public protector’s investigation into undue influence wielded by a prominent business family, the Guptas, over functions of the state; the turf war between the finance minister, the revenue collection agency and the president for control of the treasury; and the nationwide student protests in support of free tertiary education that may force South African universities to abandon this academic year. While the ICC decision will doubtless infuriate many, Zuma hopes that his stance – which is being cloaked in strong, pan-African, anti-colonial rhetoric – will resonate with his core constituency. Third, the decision will ingratiate Zuma with his African counterparts. As Zuma’s domestic support wanes, so external backing becomes ever more important. Most fellow African leaders, who have repeatedly condemned the ICC’s perceived anti-African bias at the African Union, will laud Zuma’s decision, and some will probably follow suit. It is perhaps no coincidence that the ICC decision was finalised just as Zuma returned from a visit to Kenya. Kenyan President Uhuru Kenyatta – who was charged with crimes against humanity by the ICC before the charges were dropped in late 2014 – has led the diplomatic fight against the court. The new South Africa, epitomised by Mandela, was famed for its principles. The government’s unilateral decision to withdraw from the ICC is a reflection of how much those principles have eroded since 1994, a process only accelerated by Zuma’s administration. Is it enough to save Zuma? Unlikely. But in renouncing international justice, and effectively siding with war criminals, Zuma will add another disgraceful element in the history of his disastrous rule, one that hopefully future leaders will be able to undo. This article was first published by Newsweek.